We recently completed this beautiful bespoke orangery for a family near Milton Keynes. They’d visited our showroom and had a chat with one of our designers. We were able to match the attractive ‘Bradstone’ stonework, making the orangery look like it’s always been there. This orangery is being used as an extra lounge area where the family can relax and enjoy spending time in their garden. With the surrounding patio, once it gets warmer the French doors can be opened to let some outdoor living into this home. 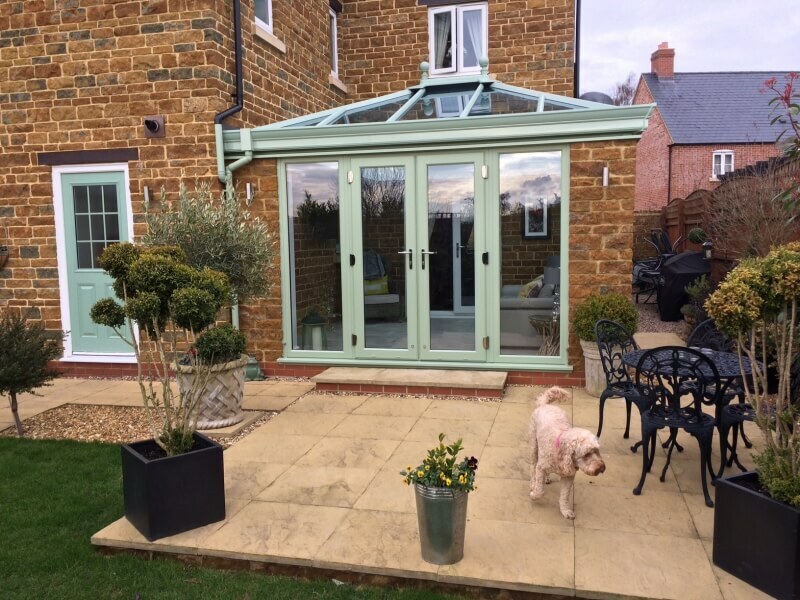 Chartwell Green was chosen for this tailormade orangery but we can create any colour including woodgrain finishes. One of the main draws of an orangery is the beautiful glass lantern roof. You can still enjoy a plastered perimeter ceiling but fill the room with light and the illusion of space. This roof features Pilkington Activ self-cleaning glass so will look as good as the day it was installed for years to come with no effort. The customer was very pleased with the finished result as well as our service. “Win-Dor took their time with us. From seeing Andrew the year before in the showroom, to Tony following up with us following completion of our orangery. The people they use are highly skilled and take pride in the finish. We investigated competitors, however, Win-Dor stood out from the rest. They exceeded our expectations and it’s their people that make the difference. Very happy to recommend them to anyone looking for a quality finish at a competitive price.” We take pride in ensuring every customer is satisfied. If we can create a bespoke home improvement for your home, get in touch today.